Sunday night, I had zero desire to cook, and was contemplating junk food (I do still do this). I resisted the urge, which was hard as hell (it is still hard sometimes), so I did what I do often, which was “what needs to be used so it doesn’t spoil?” Bell peppers and zucchini, so I decided to do a simple vegetable stir-fry. For flavor, I added shallots and garlic. When it was almost done, having been craving Thai food, I thought I’d add curry powder. It smelled amazing, but then I remembered I had pineapple in the fridge that needed to used, so I tossed that in too! What I ended up with was an awesome Thai inspired, colorful, and warm meal. 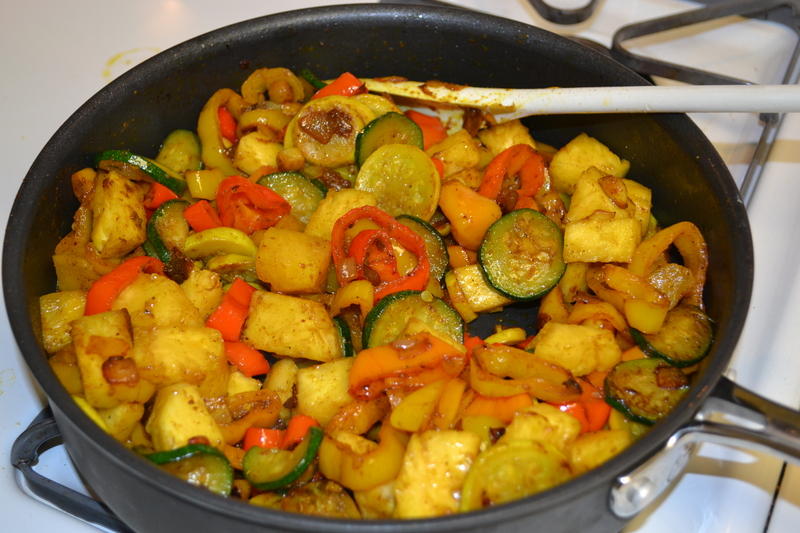 This entry was posted in Recipes and tagged Curry, Paleo, Stir-Fry, Vegetables by livinglikelinds. Bookmark the permalink. I think I would have eaten the whole pan full, looks SOOOOOO GOOD!!!! There were very little leftover, and I ate them the next day in my lunch. Then 2 days later, I made them again! Any veggies I have that need to be used, this is my new favorite quick thing to do with them.